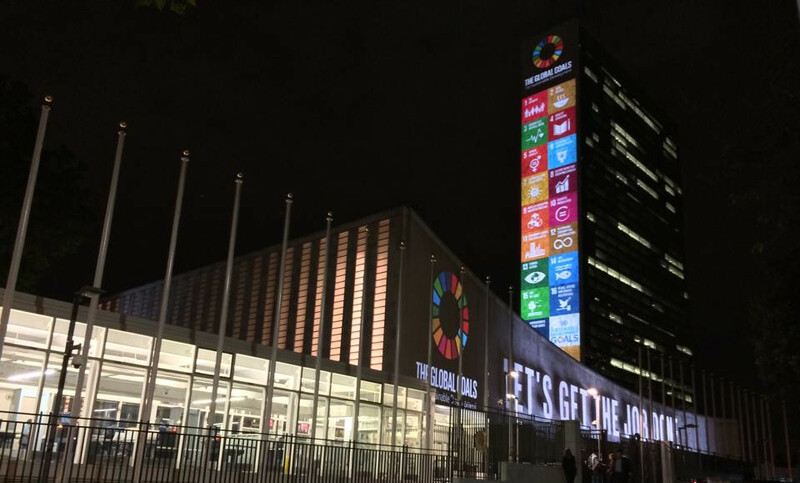 The Global Goals have launched and data is a big part of the conversation. And now, we want to act … create and use data to measure and meet the goals. I’m presenting here a “sketch” of a way to track what data we have, what we can do with it, and what’s missing. It’s a Global Goals Data Census, a bit of working, forked code to iterate and advance, and raise a bunch of practical questions. The Global Partnership for Sustainable Development Data launched last week, to address the crisis of poor data to address the Goals. Included were U.S. Government commitments to ” Innovating with open geographic data”. In the run up, events contributed to building practical momentum, like Africa Open Data Conference, Con Datos, and especially the SDG Community Data Event here in DC, facilitated by the epic Allen Gunn. And the Solutions Summit gathered a huge number of ideas, many of which touch on data. The action of taking stock of what data we have, and what we need, looks like a perfect place to start. OKFN’s Open Data Census is a service/software/methodology for tracking the status of open data locally/regionally/globally. I forked the opendatacensus, got it running on our dev server, made a few presentation tweaks, and configured (all configuration is done via a Google Spreadsheet). 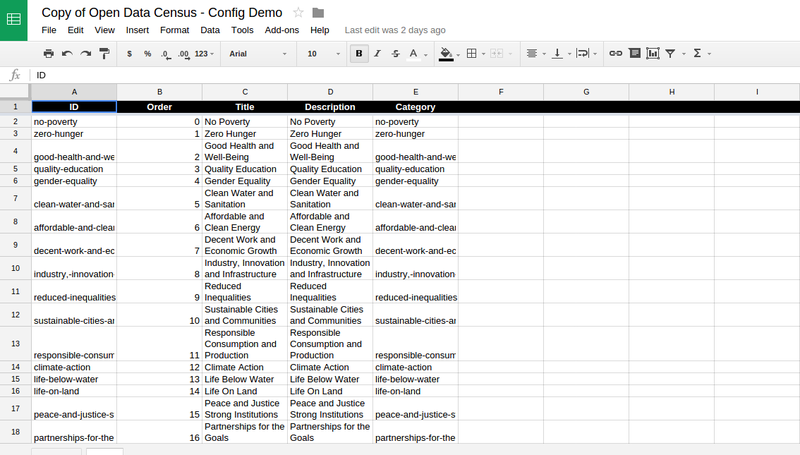 Each row of the Global Goals Data Census is a country, and each column is one of the 17 Goals. Each Goal links to a section of the SDGs Data, built off a machine readable listing of all the goals, targets and indicators. This is truly a strawman, a quick iteration to get development going. It should work, so give it a quick test to help formulate thoughts for what’s next. This exercise brought up a bunch of ideas and questions for me. Would love to discuss this with you. Does it make sense to track per Indicator, in addition to the overall Goal? There been a lot of work on Indicators, and they will be officially chosen next year. There may be multiple available Datasets per Goal of Indicator. The OpenDataCensus assumes only one Dataset per cell. For the Global Goals, are there non-open Datasets we should consider, due to legitimate reasons (like privacy). Besides tracking Datasets, we want to track the producers, users and associated organizations. The OpenDataCensus assume data is coming from one place (the responsible government entity). Much more complex landscape for the Goals. What is the overlap with the Global Open Data Index? Certainly the Goals overlap a little with the Datasets in the Global Census, but not completely. And the Index doesn’t cover every country that has signed up for the Goals. Something to definitely discuss more. Undertaking the Census, filling the cells, is the actual hard work. Who is motivated to take part, and how best to leverage related efforts. Many relevant data sets are global or regional in scope. How best to incorporate in a nationally focused census? How to fit in datasets like OpenStreetMap which are relevant to many Goals? There is an excellent line of discussion on sub-national data. There are also non-national entities which may want to track Goals separately. How to incorporate? What other kinds of questions do we want to ask about the Datasets, beyond how Open they are? Should we track things like the kind of data (geo, etc), the quality, the methodology, etc? Where could the Global Goals Data Census live? A good use of http://data.org/? Does this interest you? Let’s find each other and keep going. Comment here, or file issues. One good upcoming opportunity is the Open Government Partnership Summit … will be a great time to focus and iterate on the Global Goals Data Census. There will be an effort to expand adoption of the Open Data Charter, “recognizing that to achieve the Global Goals, open data must be accessible, comparable and timely for anyone to reuse, anywhere and anytime”. I’ll be there with lots of mapping friends and ready to hack.